Included STANDARD on all Single and Double Compartment Warmers! 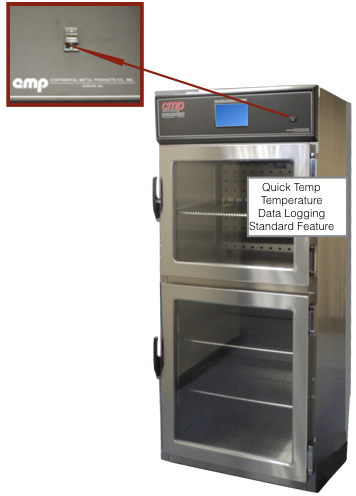 “Quick- Temp” Temperature Monitoring system is available as an option on all CMP’s Medical Warming Cabinets. 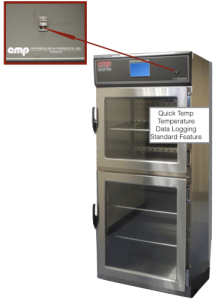 CMP’s Electronic Blanket and Solution Warmer Temperature Recorder provides the easiest Temperature Log Reporting. Easy Plug and Play Requires no additional software. Download automatically begins when a USB flash drive is inserted into the front control panel. Data is then ready to be analyzed on any computer. Data is recorded every half hour and stored for 12 months. Handwritten Logs are now obsolete! Meets AORN Environments of Care* recommendations. Temperature Monitoring system now available STANDARD on all Blanket Warmers and Hospital Warming Cabinets. Download automatically begins when a USB flash drive is inserted into the front control panel. Data is then ready to be analyzed on any computer. Alarm conditions are easy to observe and are marked by a large “X” in the report. Report contains Corrective Action taken/Resolution column for clinical staff to make appropriate notes.